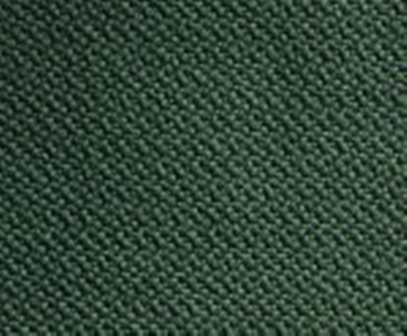 An indoor bowls carpet is manufactured from almost 100% polypropylene which is spun into a semi worsted yarn and interwoven to create a very durable open weave bowling surface. Whilst polypropylene is an incredibly hard wearing surface it has a propensity to develop and hold a static charge which is exacerbated further by the shuffling of bowler’s footwear across its surface during the course of the game. Whilst some people are more prone to static shock than others, there cannot be many bowlers who have not experienced this at some point in time when they inadvertently earth themselves by touching the scoreboards or handing over the jack. The statically charged carpet tends to draw airborne dust to it which combine with the other surface debris of chalk powder, bits of paper tissue, threads of clothing, human hair and particles of skin. The finer particles tend to work their way through the open weave carpet where they eventually reach the underlay and become trapped. The unsightly clothing threads and bits of paper tissue sit on the surface and because of their fibrous nature become inter twined with the carpet fibres itself. Using a conventional tub type suction only vacuum cleaner achieves little as the statically charged carpet holds on to the trapped dust and finds it difficult to remove debris caught up in the carpet fibres. 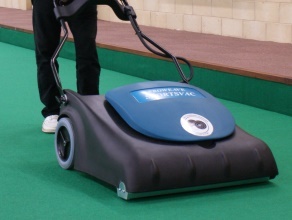 The Proweave Sportsvac has the suction power of a big industrial vacuum cleaner but in addition has a seperate motor driving a brush roll at 1800rpm. The effect of this is to beat or vibrate out of the carpet the trapped dust and dirt and also remove the surface debris caught up in the fibres. We recommend cleaning be done on a twice weekly basis during the winter months and once weekly during the summer. Without regular cleaning you will find that the carpet begins to look unsightly with a build up of surface debris particularly at the ends of each rink where most of the heads are played. If cleaning is not done on a regular basis the ends of the rinks start looking tired and bruising like effect will develop. Dust becomes trapped and compacted by footfall in these areas and are compacted further by bowls when they are dropped onto the carpet during delivery. If this compaction process is allowed to continue unabated it then becomes harder to clean these areas and they begin to look prematurely worn, which will necessitate in either a total clean of the bowling surface, a turning of the carpet or at worst total replacement. Regular cleaning also significantly decreases the risk of carpet piling which is where the carpet fibres twist and create a small nodule which in turn can affect the smooth running of the bowl. In our experience the best way to maintain the green is to adopt a regular cleaning regime where you vacuum the carpet at least once or twice weekly depending on footfall and how busy your club is during your indoor season. Usually this is for a minimum of eight months a year with a limited amount of bowls for most clubs being played during the outdoor summer season. 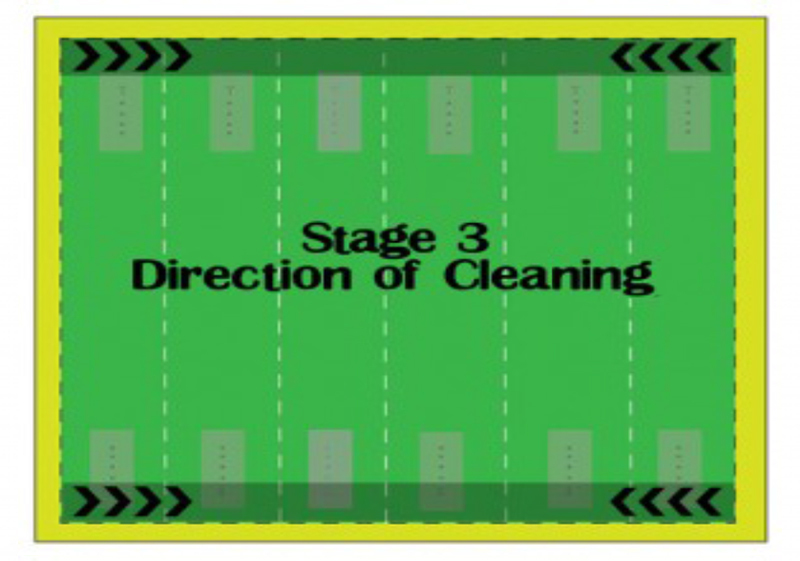 Please follow the guidelines below which have been designed to maximise the cleaning effect of your Proweave Sportsvac taking into account the areas of the green where most of the activity and resultant chalk dust, dirt and debris will be found. 1) Initially vacuum the entire green working away from the electrical power point and travel up and down the green allowing for an overlap of a few inches on each pass. In this way you always have aiming points of rink or centre markers so that you can vacuum in a straight a line as possible thus ensuring you clean the entire surface. 2) At each turn at the end of the rink try to do this keeping the brush roll on, and in one movement turn the machine on a ‘proverbial sixpence’. 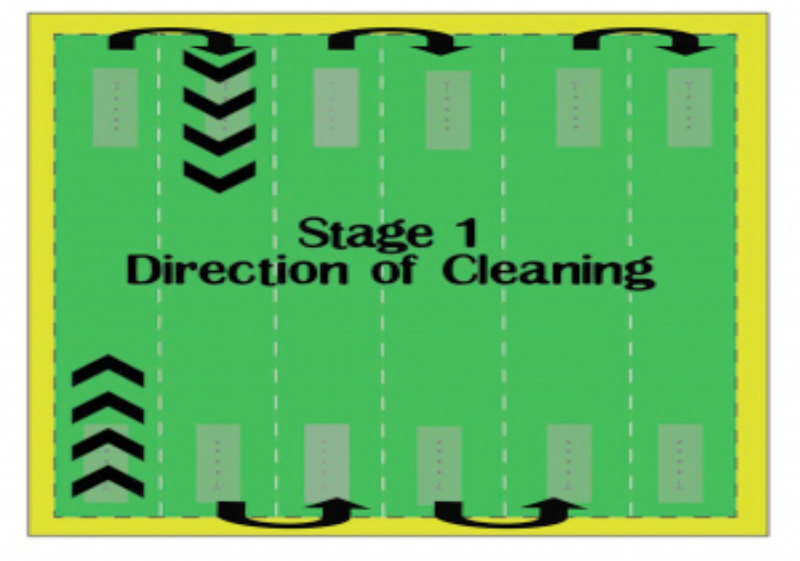 This may leave a curved dust or swirl mark on the green depending on how much dust is in your carpet but don’t worry about this as we will be coming back to this area later in Stage 3 of the cleaning program. 3) In the central area of each rink on the bottom and top two panels where the bowls head develops and the mat is placed, walk a little slower as this is the area where most chalk dust is deposited. 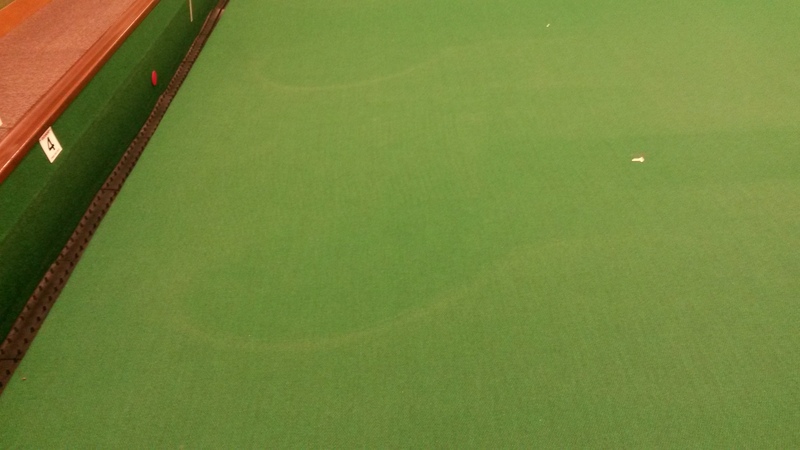 This area on indoor bowling greens is the area from the T or the two metre marker following the line of the centering spots which is where we often see a bruising like effect where the bowls on delivery, impact on the ingrained dust and dirt. Having cleaned the entire green we now need to concentrate on the top and bottom two panels which is where most of the activity takes place during a bowls match. Start by vacuuming across the green commencing at the end of the second panel and working your way toward the end ditch. Everytime you cross over the central area of each rink walk a little slower so that you again concentrate your effort on the area of the green that needs most cleaning. Finally as you approach the T or two metre marker we need to intensify our cleaning further as this is the area of the green which is where players step onto the green and bring with them any ingressed dust and dirt from the surrounds of the green. This section of carpet represents about three 3 passes with the Proweave Sportscac, we suggest therefore that you again walk slowly over this area and at the end of each run pull the vacuum backwards over the entire width of the green. 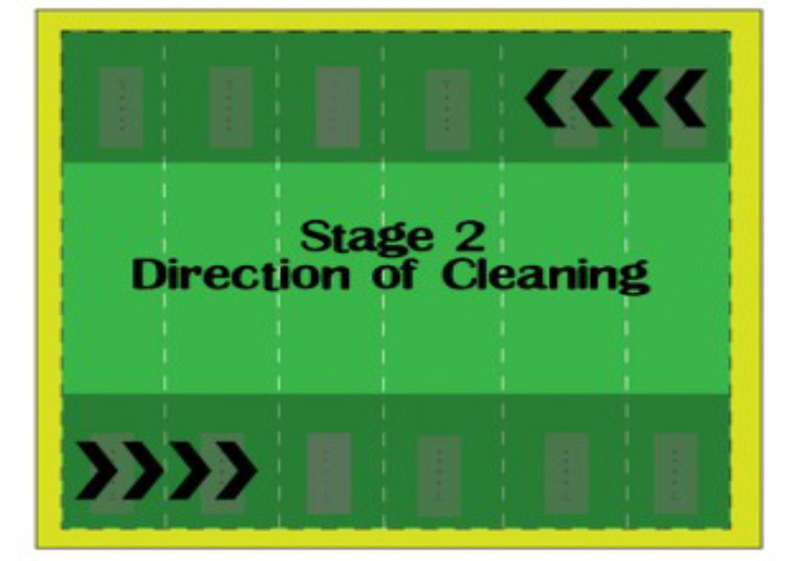 This will have the effect of doing a deeper clean on the carpet because you are working against the direction of the brush roll, and will also remove any dust or swirl marks which were created on turning when you cleaned the green in stage 1. 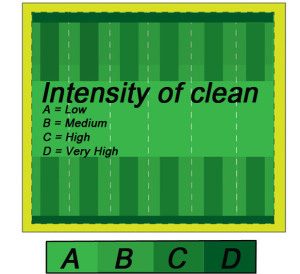 The green, once you have completed all the three stages, should compare with the diagram to the right in terms of time and intensity on certain area of the playing surface. When cleaning the indoor surface you may experience swirl marks when you make your turn by the ditch. This is caused by the brush roll vibrating dust from the lower depth of the carpet to the mid and upper levels and is more pronounced on the leading edge of the vacuum which travels quicker over the surface during the turning process and by the time the dust gets to the surface the vacuum head has moved away from this area. This is a perfectly natural phenomena and appears normally when you first purchase a Proweave Sportsvac after using a suction only machine or is simply an indicator that you are not cleaning the carpet often enough. To get rid of these swirl marks refer to section 3 above and increase the number of times you clean the carpet per week.